During the Winter edition of Wonder Festival 2018, the world’s biggest figure festival, Prime 1 Studio have unveiled their new Kat and Raven figures. 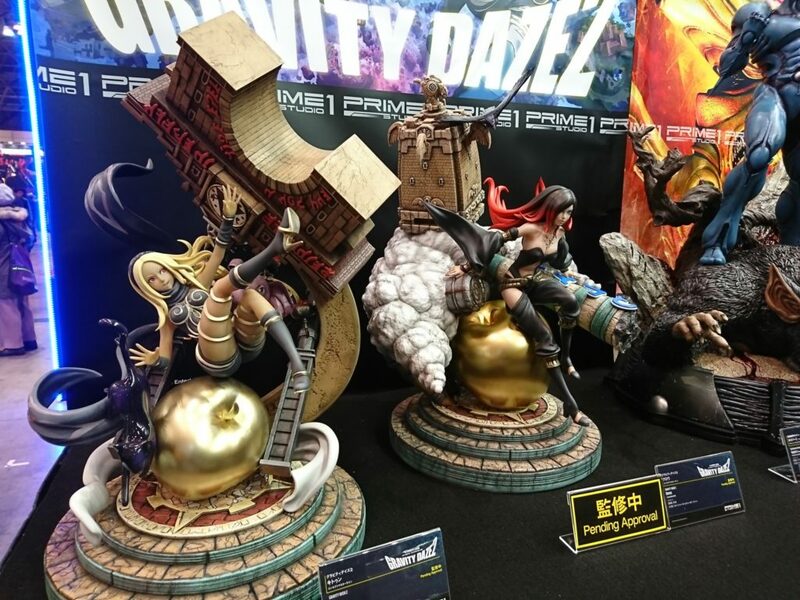 While the figures are still pending approval, they’re certainly a sight to behold, particularly due to the fact that the stand is decorated with impressive set pieces from the Gravity Rush games! Kat sits on a large golden apple, and is accompanied by an amazingly detailed replica of the top of Vendecentre’s Clock Tower. If I’d nitpick, I’d have opted for a red apple instead, and a Dusty that’s true to scale compared to Kat. The “elephant” gate from Pleajeune, while equally impressive, also feels like it might have been better off flanking Kat from the left, rather than being tucked in between Kat and the Clock Tower. For Raven, we also get the golden apple at the base of the stand, and of course the incredible detailed Ark in the background, situated on top of a cloud formation. Raven’s guardian Xii can also be seen flying alongside the Ark. What I do find a bit curious is the decision to add the remains of the Storm Tower from Endestria to Raven’s stand. After all, unlike Alias, Endestria isn’t really linked to Raven and she wasn’t part of the story arc involving the Storm Tower. But nitpicking aside, these figures look incredible. No further details regarding pricing or release date are known at the moment, but we can probably expect a hefty price tag. I’ll be sure to post more details as soon as they become available! The photos below were tweeted out by SIE Associate Producer Kyousuke Wakasa, who worked on both Gravity Rush games as well as Gravity Rush The Animation – Overture. Previous PostGravity Rush Central Celebrates Its 1st Anniversary!